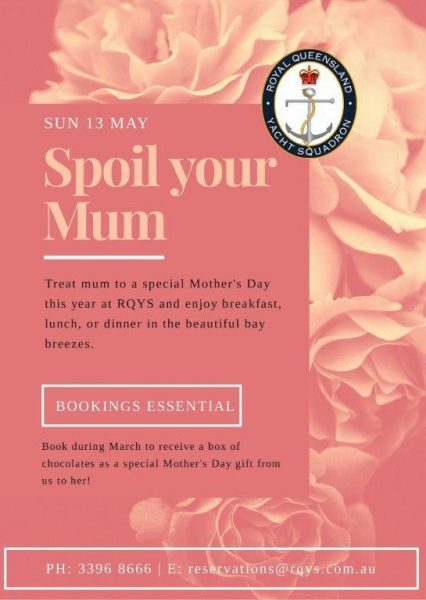 Treat mum to a special Mother’s Day this year at RQYS and enjoy breakfast, lunch, or dinner in the beautiful bay breezes. Kicking off the day will be our Gourmet Breakfast Buffet with all your favourites: from mouth-watering bacon to the classic eggs benedict. It only gets better because for lunch we have a very special menu featuring all our best Bayside flavours including prawns, lamb, chicken, duck dishes – something to suit everyone. Dinner is back to classic RQ with our regular dining options and menus. What better to help flow the day along than a relaxing jug of Pimms? We will have a Pimms promotion running throughout the day with a draw at the end! To properly capture your RQYS Mother’s Day experience, we will have lovely little set up for family photos to be taken by our staff during breakfast and lunch.